My best sound at the 2011 SSI? 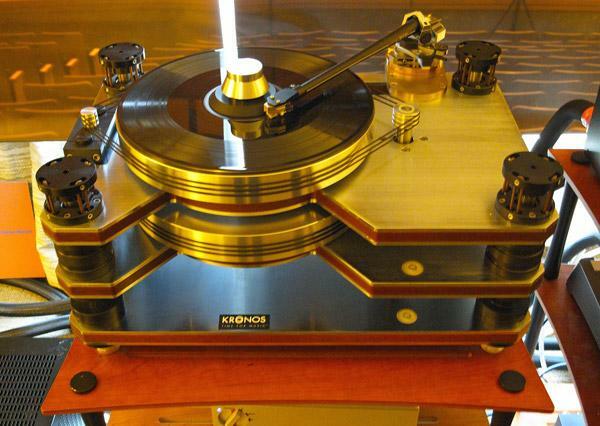 No doubt about it, it was the late Leonard Shure performing Beethoven's Op.109 Piano Sonata courtesy of the immense VTL Siegfried tubed monoblocks driving even more immense Wilson Alexandria X2 loudspeaker via Transparent Audio cables in Coup de Foudre's large room on the Hilton Bonaventure's mezzanine floor. 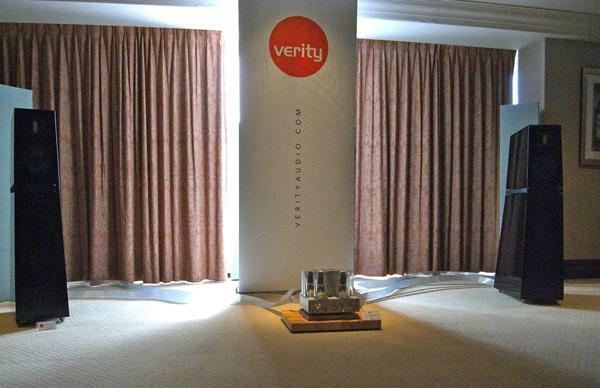 This was the last room I visited at SSI and provided a fitting climax to what had been a great Show. The trouble with audio showsapart from the cheap call girls and the occasional gangland-style executionis the fact that, even in nice hotels, the smallest rooms tend to sound like crap. 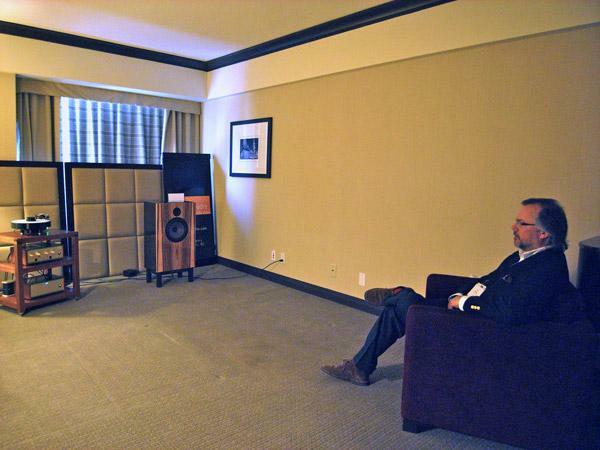 So it was at the Hilton Bonaventure, where acoustical challenges plagued no exhibitor more than Audio Note. Their excellent AN-E loudspeakera pair of which I own and loverequires that both units in a stereo pair are sited close to their respective corners. 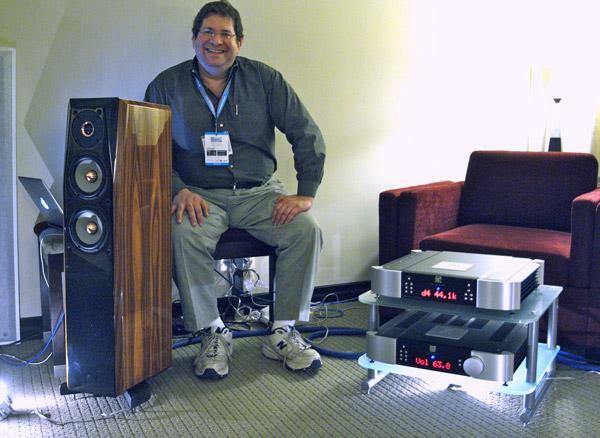 That proved impossible at the Hilton, but Audio Note’s Dave Cope compensated brilliantly and made a fine sound nonetheless with a pair of AN-E Lexus Signatures in striking maple veneer ($15,200/pair), photographed here by JA and driven by the Jinro integrated amplifier that I reviewed in the March 2011 issue of Stereophile. On Sunday at 2pm, John Atkinson gave an illustrated talk entitled "How to measure loudspeakers and what the measurements mean." The scheduling was not ideal, just three hours before the show's closing, and the door to the meeting room where the talk was held was locked, and could be opened only from the inside or with a special card, which was not provided. As a result, attendance at the talk was not as great as it might have been, but the people who were there listened with rapt attention. 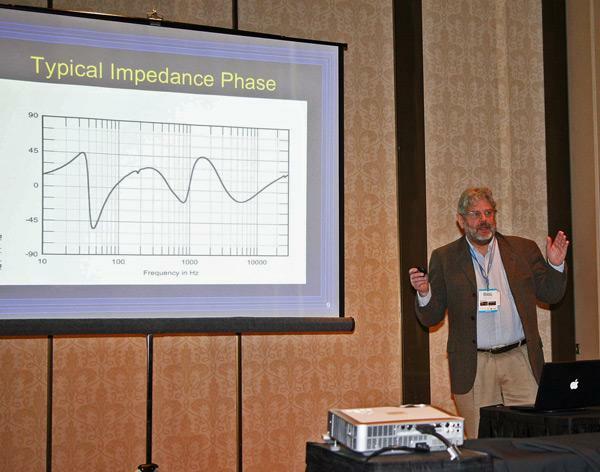 One person told me afterwards that he has a book on loudspeaker measurement that he's had difficulty understanding, but, having heard JA's presentation, it made much more sense to him. 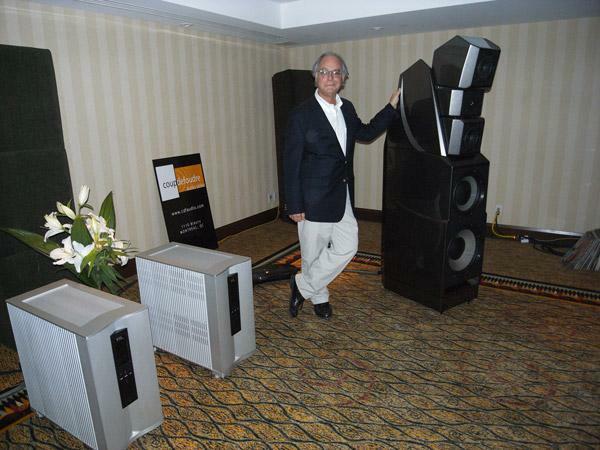 Other than the specifics of how loudspeakers are measured, I thought the most interesting part of JA's presentation was . . .
MBL has had some changes in its North American distribution the past couple of years, but now has its own US subsidiary run by the affable Jeremy Bryan, an industry veteran. 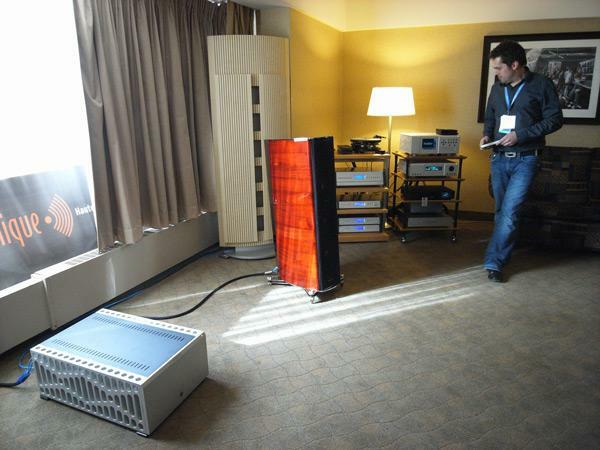 I have always loved the treble quality of the Berlin-based company's omnidirectional high-frequency "RadialStrahler" drive-units, and the Mk.2 version of the 101 speaker was sounding excellent at SSI, driven by two gigantic 9011 monoblock amplifiers (about to be reviewed by Michael Fremer), a 6010D preamp, a 1621A CD transport, and a 1611F D/A converter. Cabling was all Wireworld Eclipse. This relatively modest-looking system in yet another Son-or-Filtronique room at SSI produced some superb sound. 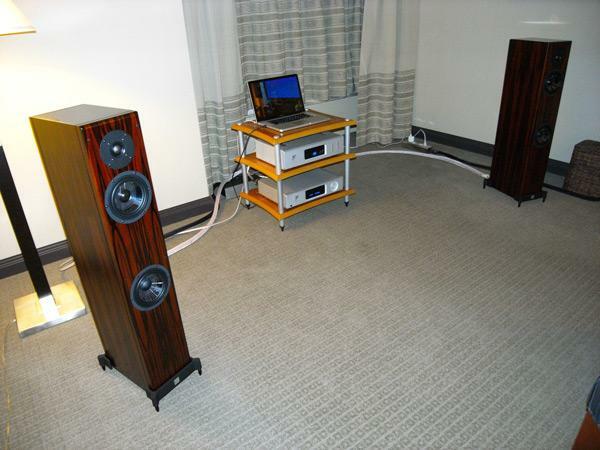 The Vienna Acoustics Mozart Grand Symphony Edition speakers ($3500/pair) were being driven by an Ayre AX-7e integrated amplifier ($3500), with the source an Ayre DX-5 universal player being used as a DAC for USB data fed from Amarra running on a MacBook Pro. The USB data connection was AudioQuest's inexpensive Carbon and one AC cable and the speaker cable was by Shunyata. There was also a single Nordost Odin AC cable. If you consider that the Ayre player was being used to provide the same functionality as a $2500 Ayre QB-9, it could be argued that this single AC cable cost as much as the rest of the system together. 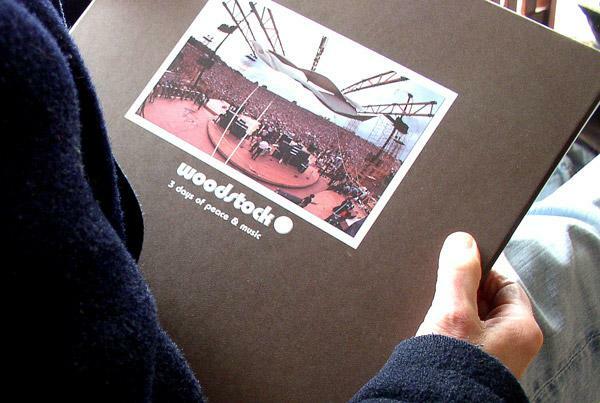 "It gives an improvement in sound quality and that's justification enough," answered Vienna's Kevin Wolff when I queried him about the system's price balance with the Nordost. 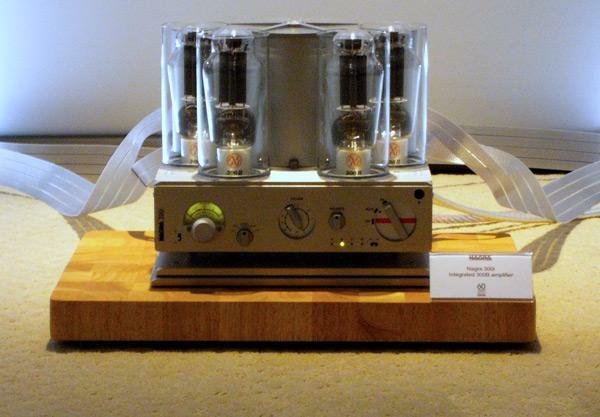 Here's a glamor shot of the Nagra 300B stereo amplifier in the Verity-Nagra room, this sample being one of the first production units. The integrated features four 300B output tubestwo each per channel in push-pulland will put out 20Wpc. 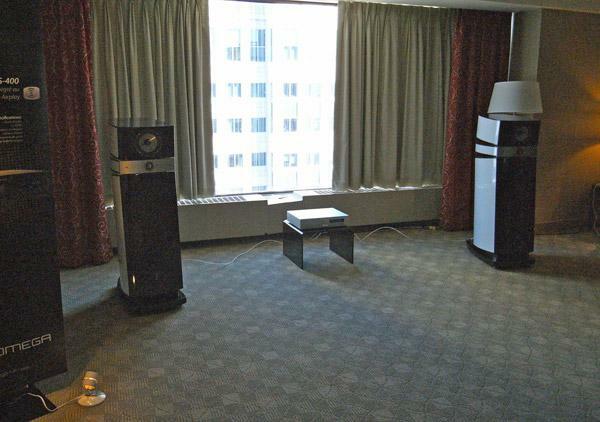 The impressive sound of the Focal Maestro Utopia III speakers in one of the SSI rooms being run by retailer Son-or-Filtronique was familiar from my July 2010 review but the small amplifier driving them via Crystal speaker cables was not. 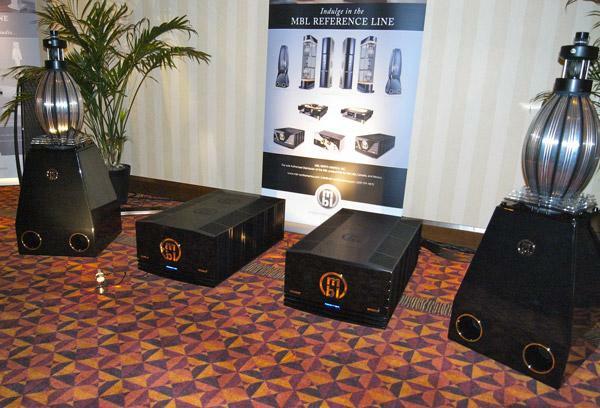 It was the Micromega AS-400 integrated amplifier ($4995), which Art Dudley will be reviewing in the July 2011 issue Stereophile. As well as the usual analog inputs, the AS-400 accepts WiFi audio data via a new version of the French company's Airstream module and uses a high-quality D/A section using Cirrus Logic DAC chips. I knew which was Joseph Audio's room without consulting the Show Guidethe sound of Louis Armstrong singing "St. James Infirmary," which has long been one of Jeff Joseph's dem staples, was audible along the corridor. 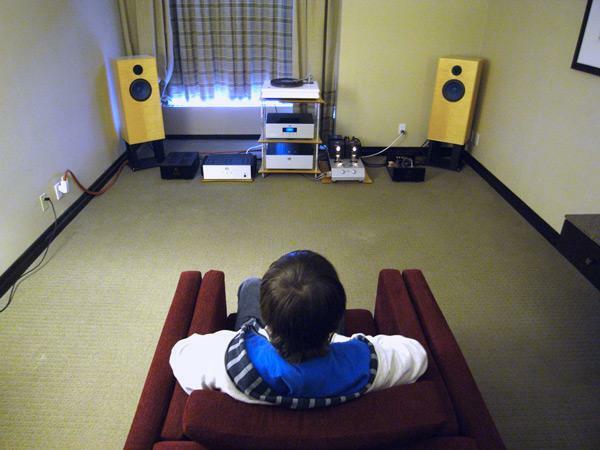 Jeff's system featured the [Perspective] loudspeakers ($11,800/pair), powered by a Simaudio Moon 600i integrated amplifier with a Moon 650D player being fed USB data from Jeff's MacBook Pro. Wiring was all Cardas. 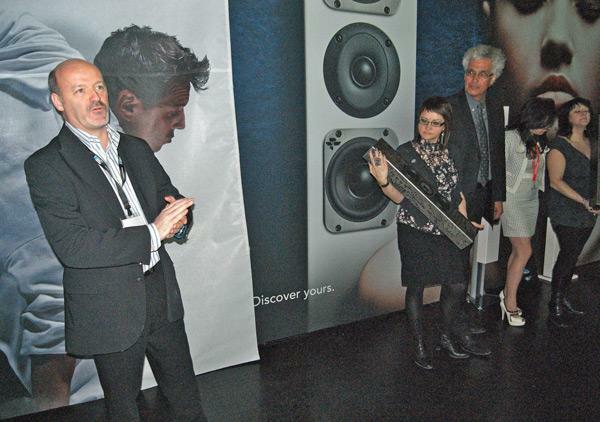 Show organizer Michel Plante (left) announced on the Show's trade day that SSI would feature a silent auction for a pair of loudspeakers that had been donated by Totem and transformed into works of art by Quebec artists Zïlon and Éric Godin. The proceeds of the auction would benefit the new Dédé Fortin Foundation, named after a popular singer who committed suicide.One of the foundation's goals is to eradicate the stigma of mental illness so that people suffering from severe depression will seek treatment rather than take their own lives.